[S399] Jill Frieders, Descentant Report. [S182] Social Security Death Index (on-line), Ancestry.com, SSDI, Ancestry.com, SSAN 311-10-4607. [S25] Hannah McPherson, Holcombe Genealogy, Page 189.1. Alfred was enumerated in the 1850 Hartford City, Hartford Co., CT, federal census, roll M432-41, stamped page 620. He was 22, an engraver. [S25] Hannah McPherson, Holcombe Genealogy, Page 189.2. Ellen Holcombe was born on 30 July 1832 at Granby, Hartford Co., CT.1 She was the daughter of Jonathan Holcombe and Annis Phelps.1 Ellen Holcombe married William John Thompson in February 1854.2 Ellen Holcombe died on 17 July 1903 at Hartford, Hartford Co., CT, at age 70.2 She was buried on 21 July 1903 at Grove Hill Cemetery, Rockville, Tolland Co., CT.
Rev. Joseph H. Twichell, pastor of the Asylum Hill Congregational Church, will officiate at the funeral of Mrs. Ellen Holcomb Thompson, wife of William J. Thompson, which will be attended at her late home, No. 282 Farmington avenue at 12:30 o'clock tomorrow afternoon. Additional services will be held at the Union Congregational Church, Rockville at 2 o'clock. They will be conducted by Rev. C. E. McKinley, pastor of the church. The bearers will be Lieutenant Colonel Charles E. Thompson, Samuel A. Bacon, Abram P. Brown, Philo P. Bennett, Arthur P. Bennett and David Calhoun. The Interment will be in the Grove Hill Cemetery, Rockville. [S663] Mary A. Elliott, Thompson Genealogy, page 116. Irving Alfred Holcombe was born in January 1856.1 He was the son of Alfred G. Holcombe and Lavinnia Hollister.1 Irving Alfred Holcombe married Belle Wood at Beloit, Rock Co., WI.1 Irving Alfred Holcombe died on 4 March 1910 at age 54. [S182] Social Security Death Index (on-line), Ancestry.com, SSDI, Ancestry.com, SSAN 273-07-7486. [S358] Arthur Stoddard Cooley, Asahel Cooley, Page 14. [S84] Benjamin Woodbridge Dwight Elder John Strong, Page 1086. [S84] Benjamin Woodbridge Dwight Elder John Strong, Page 1087. [S84] Benjamin Woodbridge Dwight Elder John Strong, Page 959. Edwin and Priscilla were recorded in the 1850 Colesville, Broome Co., NY, federal census, page 24. He was a farmer, age 30, born in NY; she was 26, also born in NY. Children in the household were Jane A., age 5, Egbert 3, and Judson 1 month. Edwin's father, Erastus, age 65 was also in the household. Edwin R. "Hokum" and wife Percillia were enumerated in the 1860 Whiteside Co., IL, federal census. The census image shows them living in Sterling, Montmorency, Whiteside Co. but the database at ancestry.com calls it Mount Pleasant, Whiteside Co. Edwin was a farmer, age 39, she was 35. Children in the household were Jane 15, Charles 10, Horace 8, Huldah 4, Ralph R. 3 months. Father Erastus, age 75 was also in the household. Widower Edwin was enumerated in the 1880 Pittsburg, Mitchell Co., KS, federal census. He was a farmer, age 60. Children in the household were Ralph 20, and Shirley G. 16, both born in IL. [S559] Letter, Trudy Holcomb Corzine to James H. Holcombe, 21 Jan 2005. 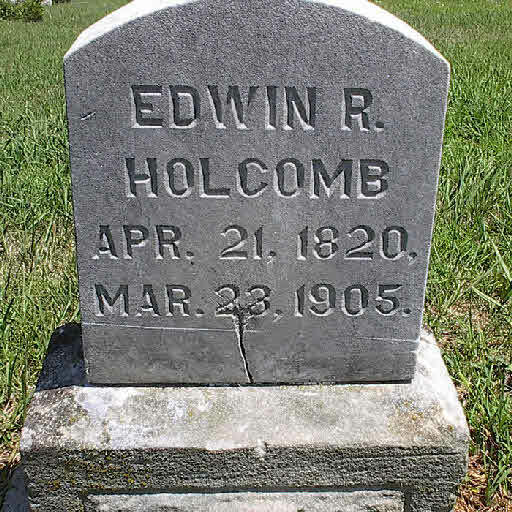 [S807] Find A Grave, online http://www.findagrave.com, Find A Grave, database and images (https://www.findagrave.com : accessed 30 March 2018), memorial page for Edwin R Holcomb (21 Apr 1820–23 Mar 1905), Find A Grave Memorial no. 30106725, citing Chester Cemetery, Chester, Thayer County, Nebraska, USA ; Maintained by Daniel L Holcombe (contributor 47054297) . [S38] 1860 Federal Census, unknown repository address.